Or I should phrase this "How to pass an IKI Krav Maga test", which apparently is not the same as in other places. Recently I have been disappointed with some of the video tests that have been sent in, but also pleasantly surprised by a few. It saddens me not to pass someone, and it frustrates me to see someone who is not really trying. As my teacher used to say, "I want to see you hungry!" I want to see that this is really important to you, that you want it the way a hungry man wants food. When I was testing for rank it took my full attention, devotion, energy; whatever was necessary. We shall discuss the good, the bad, and the ugly, and show you how to pass your IKI Krav Maga rank test, especially for the higher ranks, in person or via video. Do not send me techniques of you doing Kung Fu, Yes, I have seen this. Do not send me videos of you doing techniques that you learned years ago from another Krav Maga association. If you do not know it by now, let me inform you; we are not like the other schools. We have different techniques which we quite humbly consider superior. Please do not send me techniques from the "old Krav Maga". I know you feel comfortable with these. I know these are techniques you can do easily, but do not be lazy. I am not interested in what you learned elsewhere, I only want to see IKI techniques. In fact I am somewhat offended when I see students submitting such videos. Why am I offended? Because it shows me you have not taken the time to study the video clips I sent you. It shows me you have either not studied the DVDs which I have spent so much time producing, or worst yet, you have not even bothered to purchase them. Either way: you are not making an effort and you are not ready for a test, not with us. Let me tell what I am looking for, in particular when I test people in person. I want you to do it all on your own. I will not tell you , "Show me a gun to the head, show me a knife to the stomach. " No, I will say, "Show me what you know", and I expect you to show me techniques from the DVDs and the clips. And I want those techniques shown and explained the way I do them. I want you to flow from one situation to another, without me having to remind you what to do. It is your show, you are on your own. Start with a gun to the head, show me all three positions, show me gun to the side, to the back etc. Do not wait for me to tell you which situations I want to see. Now the good news. Here are two stories that made me happy. Recently Keith Foskey of Florida sent in a video test. Allow me to tell you how I felt; As I watched him move, and as I listened to him explain the techniques, I felt as if I was watching my own soul in another man's body. It was as if the disc from my brain was now installed into another man's heart. He performed the techniques fluently and flawlessly. He explained their applications and why they were practical, efficient and superior to older methods. And then, he went a step further. He understood the techniques so well that he explained concepts which I use but which I never really articulated or put into words. It was as if he were reading my thoughts and expressing them verbally. He was explaining things that I was only thinking but not saying on the DVDs. Watching this test showed how well our system and our on line program works. Back in Canada, there were two new members, Louisa Wiezmann and James Chartier. They have become the model for what I want to see, what I demand to see in a test. They watched, the studied, my DVDs and video clips so well that the only words I needed to say were: OK, lets start. From then they moved on from one situation to another, I never said a word. It was again, like watching myself in another body. That is what I want to see. So study my clips, film yourself, and then, before sending them to me, sit with a friend, watch my clip and your clip, and ask yourself: Are they the same? If yes, send it on. If not, repeat above process. 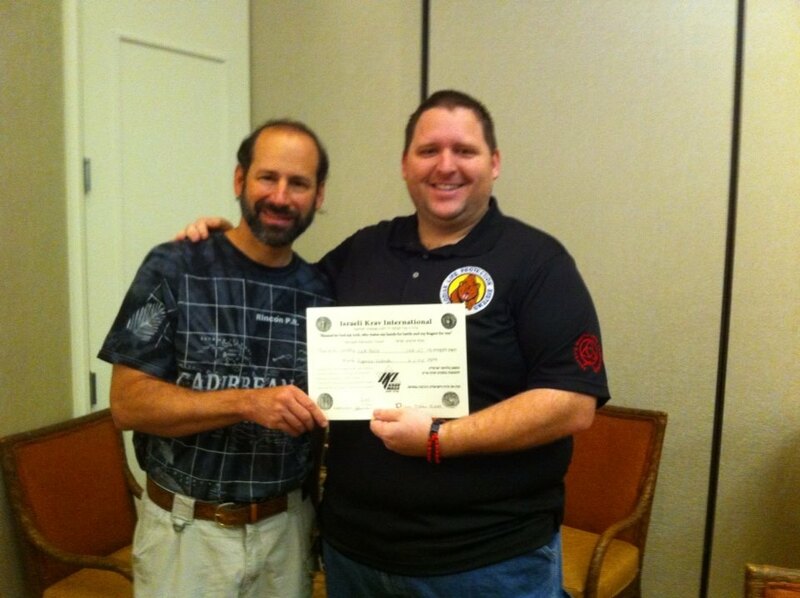 Keith Foskey being awarded his instructor rank at the Hilton Sandestin Beach Hotel, Florida. James and Louisa, Vancouver, Canada, trend setters. Tour and Train touring the Old City of Jerusalem. Students from 11 different countries. The fastest way to improve and upgrade your Krav Maga skills is to come to Israel for 10 -12 days and immerse yourself in Krav Maga. 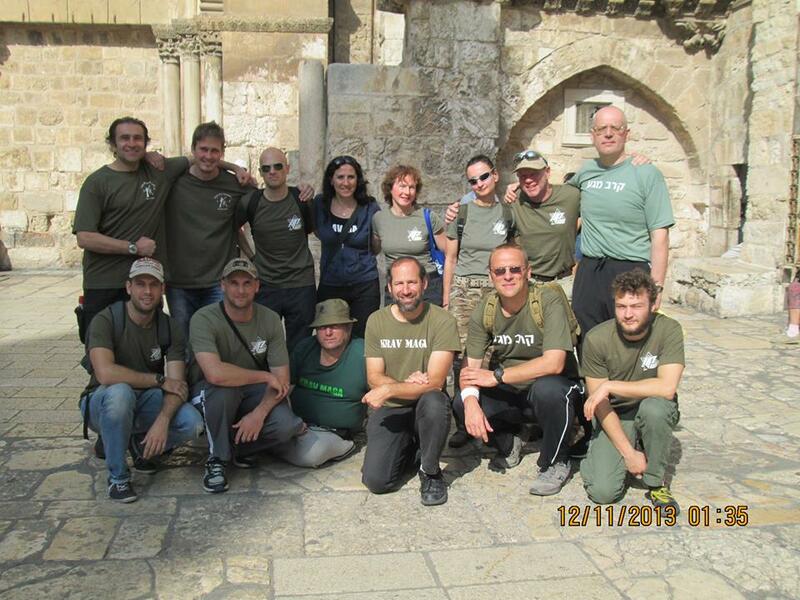 At the same time you will learn the roots of Krav Maga and the Israeli Warrior. You will grasp Krav Maga on an entirely different level. Possibility for rank testing at the conclusion of the program.